As for College basketball, my bracket was already busted. I bet yours was too after Kansas and Villa fell off, because that’s who I chose to go to the finals. Luckily I’m still leading the points in the Yahoo Fantasy game. Illgauskas is finally back with the Cavs. The Cavs are still without Shaq till probably after the playoffs, which isn’t great news for Cleveland. Last season, Cleveland ended up losing to the Magic in the playoffs. This year, the Magic look more dominant if the Cavs don’t have a healthy roster. Basically, the Magic have an improved team with Vince Carter and Cavs will have the same lineup bumping in Jamison if Shaq doesn’t show up in time. CP3 is finally back after missing 25 games due to a knee surgery repair and recovery. The Hornets probably have a slim to no chance to make the playoffs with Houston clinging on and Portland staying strong. The Celtics – The mean green stacked team are looking at trouble. After being crushed by Utah, Boston had their season record tied with the Hawks. Not to mention, the red hot Bucks are right behind their tail. Boston can easily drop to the 5th seed in the Eastern playoffs. Another small note, Rasheed is one technical away from having the game suspension rule come into play. Chicago? Toronto? Charlotte? or Miami? One of these 4 teams will probably get bumped out of the playoffs. I give the Bucks a given spot in the playoffs since they have been playing at such a great rate lately. I see Chicago not making the cut for two reasons. One, Noah and Rose are still hurt while playing. Two, Ben Gordon isn’t here to bring em in. WARRIORS FOR SALE! Enough said…. 29 straight games with 25 points or more. At this age in basketball, that’s seriously unheard of. Yeah players like A.I. and Jordan have done it, but did they do it at the young age of 21? That’s sick! 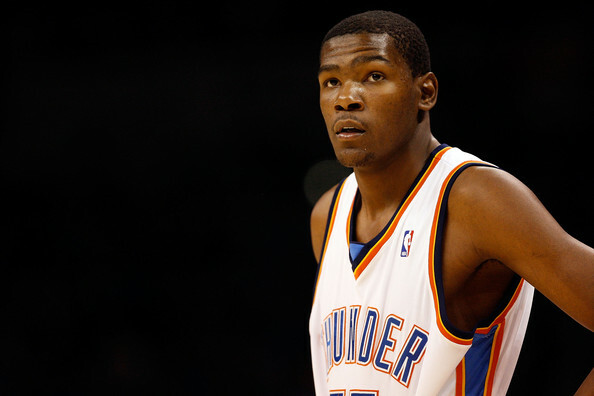 Kevin is stating to doubters and critics that he can play and lead this young Thunder team to the playoffs. Durant MUST and HAS to be placed in the same category as LeBron, Kobe, and Carmelo. The streak of 25 points or more ended at 29 games against the Spurs. Spurs have depth, I don’t blame the Thunder for losing that one. Ginobili had a last second block on Durant which ended the game. Kevin still managed to finish with 21 points, a double double, and 2 steals/blocks. To me, a player who does even just that is impressive. LeBron and Kevin are now tied for most points per game at 29.8. People favor LeBron James to win the MVP this year and I don’t blame them. James is great, Cavs have the best record, and LeBron does more than just score. If the MVP award were to be handed out today, I’d give it to Kevin Durant. Let me break it down. Kevin has played every single game so far this season. He has not scored less than double figures. LeBron edges Durant out in assists, steals, blocks, and FG% by just a bit. To me, the stats are similar enough to still choose Kevin for MVP. Let’s look at the one time called “Seattle Supersonics”. The Sonics absolutely stole that draft with KD and trading for Jeff Green. 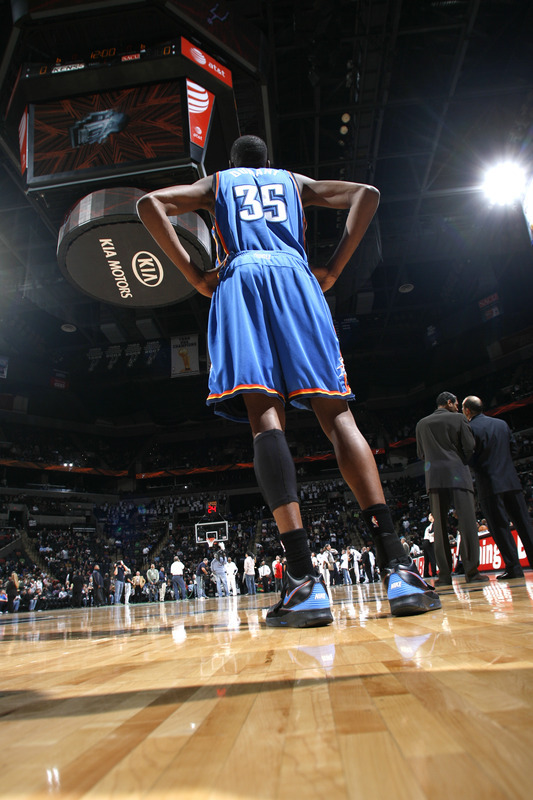 Three years later, the team is in Oklahoma City and they are looking to head to their first playoff appearance in Thunder uniform led by Mr. Durant himself. LeBron took his team to the playoffs in his fourth season. The Thunder and Cavaliers are totally different. This season, the Cavs have former All-Stars Shaq, Jamison, Mo Williams, and probably soon to be Big Z. Not to mention also talented Delonte West and J.J. Hickson. LeBron’s stats is one thing, but cmon’ that team is stacked. Let’s look at the Thunder. Obviously they have All-Star Kevin Durant, rising star Russell Westbrook, and athletic Jeff Green. Now who? There’s no one you can instantly name off the top of your head. Next one I can think of is rookie James Harden who is decent and is a back-up guard! Durant is simply carrying this team with help from only those two players while James has help from every position on his team. The Cavs should have the top seed in the East with that kind of roster. The Thunder are lucky to make the playoffs in the tough West Conference and they probably will. I can’t put Kobe or Melo in this MVP race just yet because they haven’t proved themselves this year. Yes, the season isn’t over. “Why are you giving the MVP award out so early?”. I just wanted to get my point across that Kevin Durantuala is one of the best in the league today. It doesn’t seem that KD gets enough respect. I believed in this guy since day one. On the other hand, I didn’t believe he would’ve been this great of a player this early in age. Kevin is a franchise player who should be looked at more often. Kobe, Wade,and LeBron are all investment models for companies. The first business to jump on KD won’t regret their decision. Money isn’t just the important key, but Durant is one of the most respectful, nice, and dedicated players in the game. As usual, rumors often become just rumors before the trade deadline. Not too many big deals at all. Other than that, lets recap with all the trades that went down right before Thursday night. Probably the biggest trade before the deadline was the Jamison deal. This trade surprised me. I thought the Wizards should have known better to make this team a more of a powerhouse than it already is. Don’t let the Bobcat’s whipping to Jamison’s behind fool you tonight. Antawn is a great player. His age might be a concern for the Cavaliers in the long run, but the man can still shoot the ball. Sebastian is currently injured, but I believe he may be a solid third string point guard if Mo Williams or Daniel Gibson gets hurt. Butler and Haywood are the main pieces to this Dallas team. Caron gives the Mavs another offensive threat which Josh Howard hasn’t been filling in for and Haywood gives another big body down low who can crash boards and play incredible defense. What I like to see from the Mavericks after the trade is the productivity of their bench. The bench has to be one of the best in the league today with Jason Terry, J.J. Barea, and Erick Dampier are one of the big names not in the starting lineup. I thought for one thing Houston would try to find another big man to their roster. They found two decent ones, but nothing to go “WOW” about. Kevin Martin was a great pick up for the Rockets. Shane Battier would probably move back to the sixth man spot where he does exceptionally well. Aaron Brooks should be leading this team now that Carl Landry who was probably the Rocket’s best active player this season is now gone. This trade was a great playoff push trade for the Rockets. In desperate need to find a big man, Portland finally came through landing a experienced player. Camby is a solid acquisition for the Blazers since Greg Oden and Joel Przybilla went out. Old Juwan Howard needed a break from playing so much sometime soon. 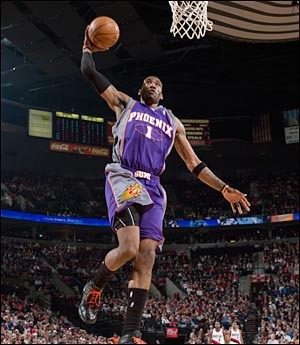 Portland plays an uptempo style which fits perfectly with Camby since he used to play with the fast paced Denver Nuggets. The Bobcats are a fun fast paced team to watch. Funny how they can beat the Cavs and lose to the Nets. Tyrus Thomas is a perfect addition to the team. The Bulls were fed up with the kid, but the Bobcats picked up the slack for them by taking Tyrus off their hands for a decent Flip Murray, traveling guard Acie Law, and a first round pick which Tyrus once was. Ratliff was a questionable decision on the other hand. But having a veteran who can protect the paint for some few minutes won’t hurt much for a second round pick. With Redd out the whole season, the Bucks look to start fresh with a new roster look. Redd’s contract will be done by the end of this season, so they are trying to find a replacement for him. Salmons is a decent pick up for the Bucks. But these trades to me doesn’t seem to make much sense. Warrick was a solid player for the Bucks. He didn’t have a great jump shot, but his athleticism makes him have skill talent similar to players like Josh Smith or Shawn Marion. I mean, he was a natural forward so I don’t expect him to shoot the ball outside much. Joe Alexander had potential to become a good player too, but the Bucks gave up on him. Milwaukee should have used this non playoff season to experiment young players like Alexander and Meeks. Nate Robinson as a sixth man for the already stacked Celtics? That’s crazy talk. Eddie House was a great role player for the Celtics. Shipping him and two young players for the 3 time Dunk Champion to me was pretty much a steal. The one problem on my mind is how is Nate going to share the minutes with Rondo or Allen? His minutes will go down for sure. Let’s see how this will work out. The New York buzz is TMAC. Tracy amazed NY in his debut scoring 26 points. I always thought Tracy still had his talent. New York needs all the expiring contracts they can get for the LeBron chase. Having Tracy a former star on the team can bring in ticket sales for the Knicks at least. Also, the Knicks got lucky getting rid of Jared Jeffries and Jordan Hill whose contracts were going to spill into next season. Chemistry issues made the Bulls ship out Thomas. Understandable in some sense, but Chicago took a huge hit on losing a talented player. On the good side, Salmons for Warrick and Alexander was a great trade for the Bulls. Warrick would fill the spot for Thomas and Alexander hopefully can develop in Chicago behind Deng and James Johnson. If Chicago is trying their best to chase after LeBron, I highly doubt it’ll happen. Their chances of landing Dwade is more likely. Clippers were all about the money in this trade. They didn’t get much, but as they say “every penny helps”. The Clips will be looking busy this off season in the free agent market. Their best addition I thought was Drew Gooden, but rumors are he might get bought out. Other rumors are that he might stay. If he stays, I see Drew getting some good minutes to show off his role player model. Blake should be starting, but of course LA has Baron as their starter. Outlaw is out. In the end, it comes out to just Benjamins. Another team who will make many moves in the 2010 market is the Kings. The loss of Kevin Martin is always backed up by Tyreke’s break out year. I felt that the Kings could have gotten much more for KMART 2. Hilton Armstrong was also a tough loss for Sacramento. Hilton is surprisingly athletic for his size and Houston got a steal for that. Of course, on the upside the Kings received one of the sixth man of the year candidates and expiring contracts. Too bad Carl is now starting and will soon be out of the award race. Washington is making the biggest push to rebuild before the deadline. They didn’t really care if they gave up Antawn. In desperate times, you need to make a move quickly. Big Z will most likely be bought out, but unsure if he will head back to Cleveland. Al Thornton was a nice cheap pick up and everyone else they got had expiring contracts. I just have to say, Memphis had one of the biggest steals of the deadline day. Darko impressed many NBA fans in his debut as a Twolve. This might be his last shot at the NBA. Darko stated he wants out of the NBA after this season and wants to head to Europ to play. After a performance like that, he should think otherwise if he keeps it up. Jodie Meeks was a good pick up for two players who practically do nothing for the 76ers. A second round pick would be pushing the Meeks trade outcome. If Philly ends up getting a high pick in the draft, the Bucks would benefit if they picked up a great player. Right now the 2010 mock draft says Greivis Vasquez from Maryland would be the Bucks pick. That’s bad on Philly’s note since Vasquez averages pretty good stats all across the board. Ratliff is old. The pick is protected. Spurs are slipping quickly out of the playoffs. If somehow the Spurs are in the lottery and get a high pick, they will regret it just a bit. Why?!?! This was just plain idiotic. Ask Deron Williams and see how he feels. As most NBA fans know, the Dallas Mavericks and Washington Wizards made the first big trade before the deadline. The Wizards received Josh Howard, Drew Gooden, Quinton Ross, and James Singleton in exchange for Caron Butler, Brendan Haywood, and DeShawn Stevenson. It’s obvious the Wizards are planning to rebuild their whole team due to the troubles they’ve gone through this season. On the other hand, the Mavericks came up big in this trade deal. Caron Butler who was once an All-Star selected player hasn’t been playing at an All-Star caliber player level. However he still has the skills and talent to become that offensive threat for a team. Butler might not get the ball as much as he did before in Washington (when Arenas was out), but on paper he makes the Mavericks look intimidating. Brendan Haywood is a solid pickup. At 7 feet tall, Haywood gives another big man on the court who can crash boards and blocks shots. What people don’t usually see about Haywood is that he works his tail off to bother players on the defensive end. Stevenson gives that in-depth shooter for the Mavs. Another deal that went down was the Clippers sent out veteran center Marcus Camby to Portland in exchange for Travis Outlaw, Steve Blake, and some cash. Clippers were all about the money on this one. Everyone in the deal has an expiring contract, but the extra money helped out the needy Clips in this one. Travis Outlaw is injured with a broken foot and won’t know when he’ll play this season. Steve Blake is a great point guard who can run the game well and play as a starter or the bench. Portland was desperately in need for a center, and in my opinion they picked up a steal. Cavaliers – The Cavs are just missing one piece to a guaranteed finals appearance, and that is a new power forward. Cleveland have tried to bid for players like Amare Stoudemire, Antawn Jamison, and Troy Murphy. So far, I think the best chance they have is getting at Troy Murphy. Rumors are that the Suns want more than just Zydrunas’s expiring contract which they’ll wave and Hickson’s talent doesn’t come close to Amare. Indiana is planning to rebuild, and Murphy’s contract is in their way for next season. Murphy isn’t like Amare, but still can give the Cavs a great shot at the title. Knicks/Rockets – The Knicks need all the expiring contracts they need for the big free agent market bidding next season. Trading for Tracy McGrady can actually be an experiment for New York. Tracy was once a star and I believe he still can play. In his expiring contract season, why not just let the guy play and have the team build greater chemistry with the player so he might think of resigning with the team for a veteran price? The Rockets on the other hand would just get a young Jordan Hill, veteran Larry Hughes who still has some gas left in his tank, and Jared Jeffries (nothing really GREAT about him). Houston would be just adding depth into their team. Wizards – They got rid of Butler for expiring contracts, now to get rid of Jamison for more expiring contracts. The Wizards to me are just going to be like the Knicks this offseason. They will be looking to invest into the 2010 free agent market. For one thing, I don’t think Jamison is going to land in Cleveland for two reasons. One, they don’t want to help the best team in the East already get better. Two, they were once rivals, why help them out? 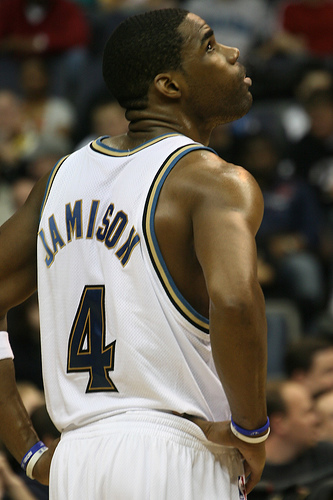 If the Wizards were smart, they’d ship Jamison out to the West. [Update] Jamison gets shipped to Cavs. I gotta ask why Washington is helping out the top East team and their rivals. Celtics – The Celts have seemed pretty busy with their trading offers. The rumors floated around with D.J. Augustin and Glen Davis aren’t true, but with names like Ray Allen and Rasheed Wallace in the picture, Boston might have something up their sleeve. This year hasn’t been the best for them and plus they built up chemistry problems. I see the mean green making a big or small move in the next day. Mavericks, Celtics, Suns, Wizards, Cavaliers, and Heat are teams making the most buzz about trades lately. Players whose names are mentioned most: Amare Stoudemire, Antawn Jamison, Caron Butler, Ray Allen, Richard Hamilton, Tracy McGrady, and Troy Murphy.